The first feature film made in Haida had its Toronto International Film Festival premiere Friday. 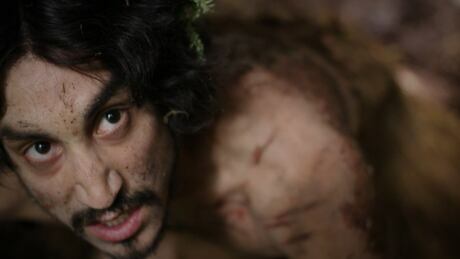 Sgaaway K'uuna, or Edge of the Knife, tells the Haida story of Gaagiixiid/Gaagiid [the wildman] set in an 19th century Haida Gwaii fishing camp. A couple of families come together for their annual gathering and experience a tragedy at the hands of Adiits'ii, played by Tyler York, who then retreats into the wilderness becoming Gaagiixiid/Gaagiid. The title is rooted in the Haida saying "The world is as sharp as the edge of a knife; as you go along you have to be careful or you will fall off one side or the other." Gwaai Edenshaw co-directed the film alongside Helen Haig-Brown. "Primarily we made the movie for our people and you could say it's an expression of our culture," said Edenshaw. The film debuted in Haida Gwaii, in the community where Edenshaw was raised, before coming to TIFF. Throughout the filmmaking process the cast and crew — who were mostly Haida — worked closely with the rest of the community to ensure that everything from the language to the clothing was an accurate reflection of Haida life. "We've done the effort, we've done our due diligence in telling the story that's so important to Haida people," Edenshaw said. "One of the best reviews we got is from one of my toughest cousins who said that he was crying inside the first 15 minutes." The film has already gained recognition for the efforts put into using multiple dialects of the endangered Haida language in the film. And while the number of fluent Haida speakers is limited, Edenshaw said the language is a part of everyday vernacular for families. "Most people have a super wide vocabulary in Haida," he said. "I think where most of us suffer is in sentence structure." Tyler York, who plays the lead role in the film, said his own knowledge of the Haida language was limited to single words. "It's one of those languages that were taken from us about 200 years ago so we're kind of slowly bringing it back," said York. Sgaaway K'uuna is presented this year at TIFF among three other new feature films and two shorts with Indigenous narratives. "What I hope this movie can do is maybe bring light to the fact that we aren't a dying race, which is what people thought we were going to be and it really almost happened," said York. "Recognize that we're still here and maybe that will help us to reconnect with our old roots."